When Approach to Venice was first exhibited in 1844, Joseph Mallord William Turner quoted Lord Byron in the catalog description: “The moon is up, and yet it is not night / The sun as yet disputes the day with her.” In Turner’s colorful view of Venice, a full moon shares the sky with the setting sun as a flotilla of barges and gondolas makes its way across the lagoon. Late in his career Venice served as a mystical muse for Turner, and the artist produced dozens of watercolor and oil paintings that explored the expressive effects of air, light, and water on the Italian city’s architecture and waterways. William Wethered [d. 1863], King's Lynn, Norfolk, and by 1849, London. Benjamin Godfrey Windus [1790-1867], Tottenham, after 1847; (sale, Christie, Manson & Woods, London, 20 June 1853, no. 5); (Ernest Gambart, Paris, Brussels, and London). Charles Birch, Edgbaston and London; (sale, Messrs. Foster, London, 28 February 1856, no. 57); bought by Wallis. Joseph Gillott, Edgbaston, by 1860. (Ernest Gambart, Paris, Brussels, and London); purchased 1863 by (Thos. Agnew & Sons, London); sold 1863 to James Fallows, who exchanged it later that year for pictures by Alfred Elmore and P.F. Poole with (Thos. Agnew & Sons, London); sold to (J. Smith, London). Bought 1870 from the executors of Smith's estate by (Thos. Agnew & Sons, London); sold 1871 to W. Moir; passed to Mrs. Emma Moir; sold 1899 to (Thos. Agnew & Sons, London); purchased the same year by Sir Charles Clow Tennant, 1st bt. [1823-1906], The Glen, near Innerleithen, Peeblesshire, Scotland; by descent to his grandson, Christopher Grey Tennant, 2nd baron Glenconner [1899-1983], The Glen; sold July 1923 to (Charles Carstairs for M. Knoedler & Co., London and New York); purchased November 1923 by Andrew W. Mellon, Pittsburgh and Washington, D.C.; deeded 28 December 1934 to The A.W. Mellon Educational and Charitable Trust, Pittsburgh; gift 1937 to NGA. Martin Butlin and Evelyn Joll, The Paintings of J.M.W. Turner, 2 vols., 2nd rev. ed., (New Haven and London,  1984), I: no. 412, begin their provenance with Windus. The picture is not mentioned by Thomas Tudor, who visited Windus on 21 June 1847, as being among the latter's collection of Turners at that time (Butlin and Joll, as per note 1 above, I: 259). This is probably John Mountjoy Smith (1805-1869), who took over the firm when his father, John Smith (1781-by 1855), the picture dealer of 137 New Bond Street, retired in 1837. The information was kindly provided by Julia Armstrong-Totten; see her e-mail, 1 March 2011, in NGA curatorial files. (In the 1992 NGA catalogue of its British paintings, the elder Smith was incorrectly suggested as possibly being this Smith.) For more about the Smith firm, see Charles Sebag-Montefiore, with Julia I. Armstrong-Totten, A Dynasty of Dealers: John Smith and Successors, 1801-1924: A Study of the Art Market in Nineteenth-Century London, Arundel and London, 2013. Royal Academy of Arts, London, 1844, no. 356. Modern Works of Art, Birmingham Society of Artists, Birmingham, 1860, no. 64. Loan Collection of Oil Paintings by British Artist Born before 1801, Art Club, Liverpool, 1881, no. 133. Royal Jubilee Exhibition, Fine Art Galleries, Manchester, 1887, no. 613. Twenty Masterpieces of the English School, Thos. Agnew & Sons, Ltd., 1896, no. 5. Works by the Old Masters and Deceased Masters of the British School. Winter Exhibition, Royal Academy of Arts, London, 1903, no. 37. Ten Paintings from the Tennant-Glenconner Collection, M. Knoedler & Co., Inc., New York, 1924, no. 10. Venezia nell'Ottocento [Venice in the Romantic Era], Ala Napoleonica e Museo Correr, Venice, 1983-1984, no. 14, color repro. Fontane und die bildende Kunst, Kulturforum, Berlin; Neue Pinakothek, Munich, 1998-1999, no. 28, repro. (shown only in Berlin). 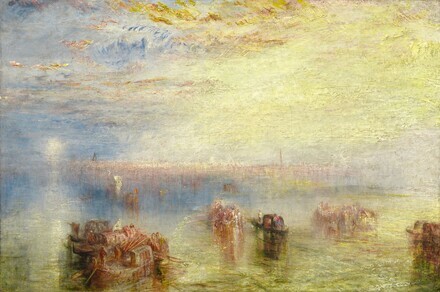 Turner and Venice, Tate Britain, London; Kimbell Art Museum, Fort Worth, 2003-2004, no. 49, repro. J.M.W. Turner, National Gallery of Art, Washington, D.C.; Dallas Museum of Art; The Metropolitan Museum of Art, New York, 2007-2008, no. 151, repro. The medium-weight canvas is finely plain woven; it was lined in 1971. The ground is off-white. The painting is executed with thick white impasto covered with very thin transparent glaze washes of intense colors which create a flickering effect in the highlights. The glazes have been abraded, or possibly, in the case of the red lakes beneath the city, have faded. The impasto has been slightly flattened during lining. There is extensive craquelure which significantly disrupts the composition. There are a great number of scattered small retouches in the sky and foreground. The dammar varnish applied in 1971 has discolored yellow slightly. Spectator, 17, no. 828, 11 May 1844: 451. The Times (London), 8 May 1844. Ruskin, John. Modern Painters. 5 vols. London, 1843-1856, 1 (5th ed., 1848): 136; The Works of John Ruskin. Edited by E.T. Cook and Alexander Wedderburn. 39 vols. London and New York, 1903-1912; 3:250. Ruskin, John. Notes on the Turner Gallery at Marlborough House. London, 1856: 74; The Works of John Ruskin. Edited by E.T. Cook and Alexander Wedderburn. 39 vols. London and New York, 1903-1912, 13:166. Ruskin, John. Notes by Mr. Ruskin on His Collection of Drawings by the late ... Turner. London, 1878: 10; The Works of John Ruskin. Edited by E.T. Cook and A. Wedderburn. 39 vols. London and New York, 1903-1912: 13:409. Preliminary Catalogue of Paintings and Sculpture. National Gallery of Art, Washington, 1941: 200, no. 110. Book of Illustrations. National Gallery of Art, Washington, 1942: 241, repro. 19. Paintings and Sculpture from the Mellon Collection. National Gallery of Art, Washington, 1949 (reprinted 1953 and 1958): 125, repro. Summary Catalogue of European Paintings and Sculpture. National Gallery of Art, Washington, 1965: 132. European Paintings and Sculpture, Illustrations. National Gallery of Art, Washington, 1968: 119, repro. Dugdale, James. "Sir Charles Tennant: The Story of A Victorian Collector." The Connoisseur 178 (1971): 8-9, 12, color repro. 2. European Paintings: An Illustrated Summary Catalogue. National Gallery of Art, Washington, 1975: 354, repro. Walker, John. National Gallery of Art, Washington. New York, 1975: no. 604, color repro. Gage, John. Collected Correspondence of J.M.W. Turner. Oxford, 1980: 200, no. 270. Butlin, Martin, and Evelyn Joll. The Paintings of J.M.W. Turner. 2 vols. New Haven and London, 1977. (2d rev. ed., 1984): 1:no. 412; 2:color pl. 417. Walker, John. National Gallery of Art, Washington. Rev. ed. New York, 1984: 413, no. 589, color repro. European Paintings: An Illustrated Catalogue. National Gallery of Art, Washington, 1985: 404, repro. Chapel, Jeannie. "The Turner Collector: Joseph Gillott, 1799-1872." Turner Studies 6 (1986): 47. Hayes, John. British Paintings of the Sixteenth through Nineteenth Centuries. The Collections of the National Gallery of Art Systematic Catalogue. Washington, D.C., 1992: 288-291, color repro. 289. Hand, John Oliver. National Gallery of Art: Master Paintings from the Collection. Washington and New York, 2004: 349, no. 281, color repro. Schwander, Martin, ed. Venice: From Canaletto and Turner to Monet. Ostfildern, 2008: 65-66, fig. 9. Hultzsch, Anne. Architecture, Travellers and Writers: Constructing Histories of Perception, 1640-1950. Leeds, 2014: 141-142, fig. 4.5.